Great benefit to the health of such a wonderful product, as yogurt has long been no doubt. This sour-milk drink has a beneficial effect not only on the stomach and intestines, but also on the state of hair, nails, and skin. This wonderful drink strengthens the immune system and removes toxins and salts from the body, helps to cope with many diseases and is an excellent basis for a diet for weight loss - kefir diet. A lot has been written about the kefir diet. The fact that kefir diet really helps to lose weight without hunger strikes and torment is a recognized fact. Let us also understand all the subtleties of kefir diet and try not only to lose weight with kefir, but at the same time and improve the whole body and improve the skin and hair. There are several variants of kefir diet. The first of them is a pure mono-diet: 1-1.5 liters of fresh kefir without sugar, drink for five to six meals at regular intervals. Duration of the diet is 3 days. You can, using the same 1-1.5 liters of kefir a day, add another half kilo of sweet fruits and vegetables. On this version of the diet, you can "sit" 5-6 days. 7 day - mineral water. To repeat a diet not earlier than in a month, it is better in one and a half-two. The first thing you should do when you sit down on a kefir diet is to give up all the flour and sweet, as well as from potatoes, bananas and grapes. The second rule is protein. Protein is needed and therefore you can not give up fish and meat, but only low-fat fish and lean meats are possible. Another rule is that all dairy products used on a diet should contain 0% fat. Watch for fats - half of the fats on your diet table should only be of vegetable origin. You must drink a liter of kefir a day and a liter of water. More water is not needed - watch out for fluids. When kefir is very boring, it can be replaced for a couple of days with fresh juices or other sour-milk products. You can not eat more than 5 grams of salt per day on kefir diet. Less salt! Another rule is to eat more non-starchy vegetables and fruits. You can eat often - up to 6 times a day, but in small portions. 2. 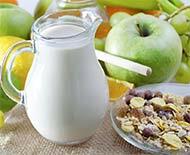 This kefir diet means that you will drink at least a liter of lean yogurt per day. Divide the yogurt into 6 receptions. For three days of strict kefir diet can lose up to 2 kg of weight!